Health Kick.... well for 52 weeks at least hopefully! Ok perhaps this is not so much as a kick but a lifestyle change! To look at me, some might not realise that I used to be extremely fit. From the age of about 8 I was a competitive swimmer, living in Enfield in North London, I swam for 2 teams (Enfield Swimming Club and Edmonton Phoenix). I was ok at the sport, but importantly It made me extremely fit during my teens right up into my early twenties (even though I stopped at 17). I used to swim at least 6 times a week usually for at least 2 hours each time. I fell out of love with swimming after that, but now I am going to get back in the pool! 4 years ago I had a Jet Ski accident which unfortunately has left me with a lower leg injury (basically its bigger than my right and if I injury myself I can't feel it until to much damage is done), and until then I was doing well with my health kick and have not really been able to get back on it since then! This time I am hoping to make this a more permanent fixture in my life and make time for exercise, I am not getting any younger (36 this year!!) and I am hoping to shed some pounds as a result! 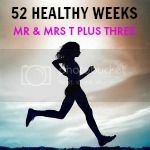 As most people know, I love my social media and to give me a bit of motivation I am linking up with @MrandMrsTplus3 who is doing a #52healthyweeks on her blog! If you want to get involved have a read of Amy's post here. For me this is not going to be a massive change but more a gradual change through out the year and will hopefully share my successes as we go. Cut out the fizzy drinks, I never drink full fat, only ever diet drinks but they are going. This is just to start, you may have noticed I have not put alcohol, this is because that would be cheating as I hardly drink... by hardly I literally have a beer ever couple of months! Any way this post is far to long but this is a heads up of what I am up to. If you are having a health kick in the new year what goals have you set yourself?